Sick´s line of IVC smart cameras are self-contained, stand-alone vision systems with an easy-to-use graphical user interface, enabling fast development for 2D and 3D applications. They combine imaging and analysis into one camera. These flexible, high-performance cameras provide tools for inspection, robot guidance, measuring and identification. With only one camera, you can perform any combination of advanced inspections and measurements to optimize production quality. The cameras support customized operator interfaces, and communication via I/O, serial and Ethernet. Rugged, industry-grade digital cameras with GigE interface. Streaming cameras provide continuous data acquisition for external image processing on a PC. With a variety of data generation options, including 2D and 3D images, they offer maximum flexibility. With IP67 enclosure rating, the midiCam streaming camera family is ideally suited to use in harsh industrial environments. This is why the midiCam has an M12 GigE interface – the standard for industrial image processing – as well as industry-grade M12 connections for the voltage supply and trigger signals. As an alternative, it is also possible to operate it with just one cable measuring up to 100 m in length using Power over Ethernet (PoE). Sick’s 3D vision series offers a wide range of powerful and flexible products designed for reliable operation in harsh industrial environments. They range from versatile high-speed cameras that deliver high quality 3D and contrast images to smart and configurable stand-alone sensors that facilitate rapid development and easy integration. Their scalability ensures a perfect fit with your 3D vision application. Ruler E is a perfect tool for in-line 3D-scanning applications. It is designed for the tough environments common to the timber and mining industries and will provide accurate 3D measurements at temperatures as low as –30 °C. Plus, the Gigabit Ethernet interface makes it suitable for remote operation over long cable distances. Sick high-end cameras are the ultimate cameras for the most versatile needs. With their unsurpassed 3D measurement speed combined with high data quality, and flexible MultiScan functionality, they are used in tough industrial environments worldwide. The high-end cameras provide vital object information, such as 3D shape, contrast, color, gloss, and surface defects - all at the same time - creating reliable solutions for demanding applications. Machine vision technology gives machines the gift of sight, replacing or complementing manual inspection tasks by using digital cameras and image processing. Among other technologies, 3D technology in particular is suitable for analyzing volume, shape or 3D position of objects, but also for detection of parts and defects that are low contrast, but have a detectable height difference, thus, enabling new applications. Laser triangulation uses a laser line and a camera to collect height profiles across the object. The profiles are put together to create a 3D image while the object is moving. At TPL Vision we understand that the cost of dealing with illumination in your machine vision project can be very high. The key to achieving a robust solution is known to be the correct illumination. We know that integrators have to evaluate, budget and deal with loans just to find the perfect solution. This is why TPL Vision now offers multiple lighting solutions with just a few references. The modular Ringlight is an innovative solution from TPL Vision. With just a few references we can test different scenarios in each application and reach the optimum solution. The TPL Essential EBAR+ is a highly powerful LED light, very useful for machine vision applications requiring intense luminous flux. It can be set up downwards, in the same axis as the camera’s, or with an angle of incidence, to perfectly illuminate rectangular areas on a production line. The Essential EBAR+ is very easy to use: you don’t have to adjust anything, only to plug it. There are 2 functioning modes: continuous and strobe, with very short rising and falling times (15 μs and 10 μs). Its black aluminum structure, very robust, is IP65. It also helps to dissipate the heat generated by the LED. Moreover, 2 LED indicators near the connector show if the product is powered. The Essential EBAR+ is available in different colours and in multiple lengths, from 17 cm to 1,m3 m.
Easily get a better uniformity! The EBAR Curve has been developed by TPL Vision so as to get illuminations that offer full homogeneity on the total surface, including on the edges. Up to now, when you had to select a bar, you had to choose a product larger than the field of view (FoV). With the EBAR Curve, no need to spend time wondering what would be the right size. As the bar will light the entire surface, you can decide to get a bar with the same dimensions as the FoV. This can be very useful when the overall dimensions of the bar represent a major issue in the vision system. Both powerful and very diffuse, the Medium Flat MFDOME+ can deal with many machine vision applications. The TPL Medium Flat MFDOME+ has been designed to detect small pieces in a container, to highlight thermoformed products or also to improve contrasts on workpieces made of several materials. The OVERDRIVE version can offer a lighting power far higher and the TRINITI version (with no current control inside) even more. It works in continuous and strobe mode, with very short rising and falling times: 25 μs and 15 μs. Part handling is one of the most important applications for factory automation. The use of flexible robots for this task represents a cost-effective alternative to traditional manual and semiautomatic handling systems. 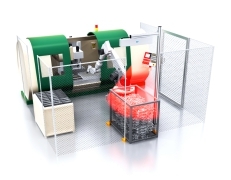 The PLR has been developed for robot automated part handling. It is a standalone device that includes all the localization functions, an easy-to-use robot interface, as well as all the functions necessary for rapid integration with the robot. Tailor-made 3D solutions for flexible automation. The TriSpectorP1000 is a programmable 3D camera ready for Industry 4.0. Part of the Sick AppSpace eco-system, the 3D camera and the software tools that are included open up possibilities for tailor-made solutions – with easy commissioning and operation in areas such as quality control, robot handling, and profile verification. The TriSpectorP1000 operates stand-alone and contains imaging, lighting, and analysis in a single rugged housing. Laser triangulation technology provides color-independent, contrast-independent, and true object shape data in millimeters. The TriSpectorP1000 is the perfect choice for fully flexible, cost-efficient, in-line industry automation solutions. Sick offers a broad portfolio of vision products ranging from easy-to-use configurable sensors and programmable flexible cameras to high-speed streaming cameras to meet the toughest of requirements. Programmable cameras facilitate high flexibility and work independently without a PC. They have integrated image processing and deliver results as output. The TriSpector1000 is a stand-alone configurable sensor for cost-efficient 3D inspections. No matter what the shape, color or orientation of the product, the sensor is up to the challenge. Now content, completeness and emptiness can be verified in all dimensions. It is perfectly suited for solving quality control applications in the consumer goods and packaging industry. Position, inspect and connect with the PI50 vision sensor. The PI50 provides flexibility in high-speed positioning and inspection applications. With its powerful toolbox and variety of interfaces, the PI50 is the optimal choice for machine integration. With the Inspector PI50, users can easily build their own operator interfaces, as well as operate the vision sensor from any computer or operator panel that contains a standard web browser. The PI50 is available in a white or IR ring light option. Inspector PI50 is a 2D vision sensor for high-speed positioning and inspection applications. Inspector PI50 is configured through the SOPAS Single Device tool to analyze specific vision tasks and to communicate over different interfaces. Sick Inspector PIM60 is a 2D vision sensor for high-speed positioning, inspection, and measurement applications. The Inspector is configured through the SOPAS Single Device tool to analyze specific vision tasks and to communicate over different interfaces. After finished configuration, the Inspector is running stand alone and continuously reporting the result over the configured interface. Robust part inspection with high performance is an easy task! The Vision Sensors from Sick are easy to use, rugged and reliable. They are designed to do application-specific tasks where a standard sensor would not work. Sick provides Vision Sensors to detect part presence, part position and identification, colour sorting and recognition. 3D Snapshot – For versatile use indoors. Visionary-T 3D vision sensors from Sick offer maximum flexibility for indoor use. The innovative 3D-snapshot time-offlight technology provides the Visionary-T with real-time depth information for each pixel, even for stationary applications. The output can be either pure 3D raw data, or reduced data that suits the respective application. The high-performance visualization tool and reliable 3D data output make the Visionary-T from Sick the ideal solution in diverse applications within intralogistics, robotics, or industrial vehicles. Sick’s PLB vision system is designed for precise localization of randomly orientated parts in bins and boxes. It enables the easy introduction of new parts into existing work cells and short part changeover time by using CAD-based 3D shape matching part localization software. The PLB’s performance supports high production rates. The vision system consists of a 3D camera, part localization software and tools for easy integration and communication. The system’s advanced 3D camera ensures superior image quality and provides high immunity to ambient light. Field-proven tools and functions for calibration, communication with a robot and PLC, as well as checking for free gripping position, make it easier to integrate the system into production. The hardware and software are already integrated and pre-set for the application.